Facing today’s digital transformation as well as higher regulatory and quality standards, the demands of almost every business area have changed. Needless to say, these changes have not spared the field of parts and surface cleaning and consequently ask for new products and processes. Integration also is the keyword for the automated compact application carrier, which – depending on the objective – can be equipped with plasma, EcoCsteam, laser CO2 snow jet or the EcoCbooster technology. The application can be put into operation in various use cases with regard to the partial cleaning and activation of metal and plastic workpieces in the fields of electromobility, supplier industry and medical technology. Since April 2017, we have been presenting ourselves as the SBS Ecoclean Group and thus ushered in a new era for our Group companies. Today, a year on, we are excited to show you our first corporate video explaining what our new company stands for and how we want to shape the future of industrial parts cleaning and surface processing. In the leading role – our employees. They are the heart and soul of the SBS Ecoclean Group, and the core of our success. Follow them in the video and get an authentic insight into the SBS Ecoclean Group. Learn what drives us every day and see how we are going to contribute to the success of our customers in the future. The requirements placed on the surface cleanliness of components, in particular to minimize film-type contaminants, are increasing. This is because many downstream processes, such as adhesive bonding, painting or coating call for profoundly clean and sometimes activated part surfaces. Wet chemical cleaning alone can often not meet these steadily increasing requirements. Even after the cleaning process, there are still some very fine film-type residues on almost all surfaces. These contaminants reduce drastically the adhesion of other materials during the subsequent processing. Many companies use distinct plasma systems to clean their components in a separate cleaning process. 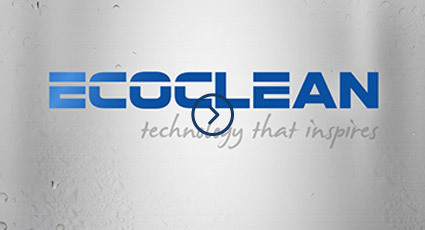 Ecoclean goes one step further and integrates the plasma technology directly into existing cleaning systems – no further machine is necessary. 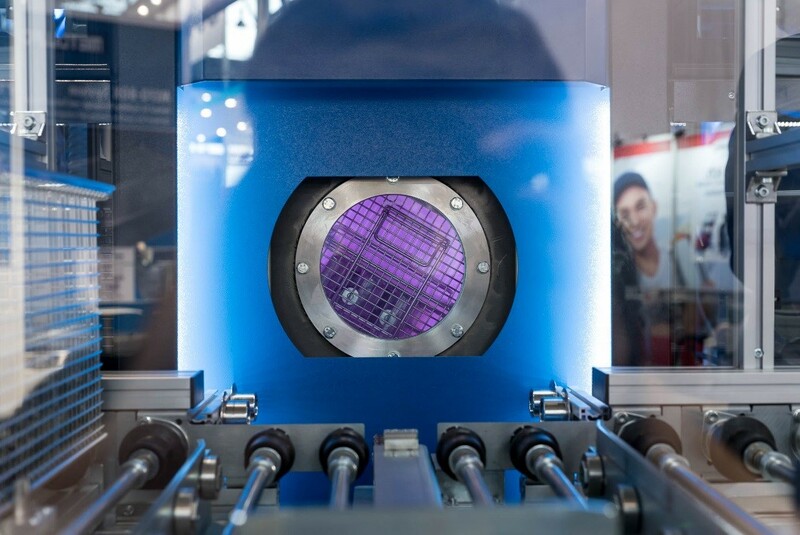 In low-pressure plasma technology, by supplying energy process gas is stimulated in a deep vacuum. Thereby a plasma of high-energy ions and free electrons – plus other reactive particles – is formed. Cleaning is initially performed as usual by a solvent-based wet process, followed by vacuum drying of all workpieces. After this step, the work chamber is rinsed with filtered ambient air. The pressure is reduced to less than 1 millibar, whereupon the process gas (e.g. air or oxygen) is introduced. The plasma is then ignited and hits the surface which is required to be treated. Contaminants on the part surface, such as grease or oil residue, are chemically attacked and transformed into volatile compounds. Plasma cleaning represents a final cleaning step and is used for ultra-fine degreasing. The low-pressure plasma cleaning significantly reduces film-type contaminants of components, such as oils, greases or waxes. Optimum surface adhesion is achieved, and subsequent processing steps can be carried out without any problems. The treatment time takes one to several minutes. The degree of cleanliness of the components is measured with the aid of surface tension (mN/m). By means of plasma cleaning, Ecoclean machines achieve a degree of cleanliness of 60 mN/m to 80 mN/m. In comparison, wet chemical cleaning only allows a degree of up to 40 mN/m. In order to carry out low-pressure plasma cleaning, Ecoclean equips the machines with electrodes, a generator and the process gas supply. The advantage of the integration: The machine offers two cleaning procedures, which can also be used individually. Plasma cleaning, however, requires wet pre-cleaning and drying of the components. 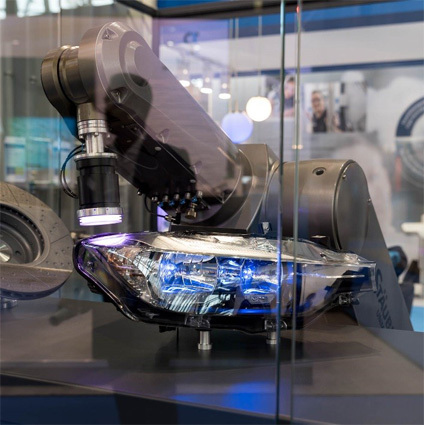 At the parts2clean 2018, no one was able to get around the trending topic “Industry 4.0.” Its importance was even boosted by a survey published before the trade fair by the Fachverband industrielle Teilereinigung (FiT)*, according to which most experts in parts cleaning do not yet feel ready for digital transformation. Not so for Ecoclean. 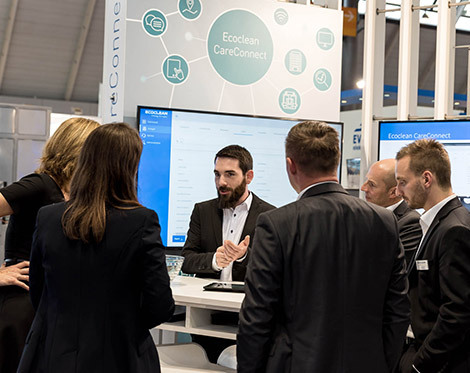 With its IoT platform solution "CareConnect", the market leader for industrial parts cleaning and surface processing showed what smart cleaning looks like. It permits an integration of several cleaning systems for an effective machine fleet management. 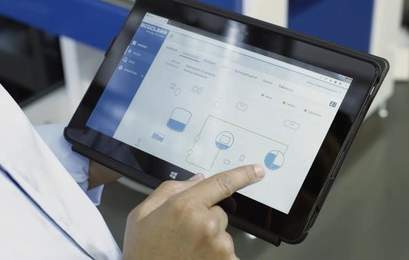 Care Connect allows easy and quick documentation of machine and process conditions that even meet requirements in the aerospace, medical equipment, automotive and other industries. An integrated maintenance forecast reminds the user how many operating hours are still available before the next maintenance is due. Calculation of key performance indicators (KPI) like Overall Equipment Effectiveness (OEE) help users to determine whether the system is capable of handling a projected higher cleaning output. In the event of a fault, a diagnosis can be derived quickly and easily from the stored data without any need for laborious troubleshooting. A malfunction report can be sent directly from the system, thereby reducing communication barriers. In the process, Ecoclean paid great attention to state-of-the-art data and communication security standards. The user has full transparency regarding which data was captured for which purpose. A further level of safety was implemented by ensuring that all access to the PLC of the machine is read-only. Thus, any external intervention can be avoided. The cloud solution was realized initially for the EcoCcore solvent-based cleaning system but will be continuously expanded for further machine types. You would like to take the next step towards a network of real-time data in which all production components communicate with each other? *Source: http://www.parts2clean.de/de/news/artikel/so-verbessert-die-industrie-4.0-die-teilereinigung.xhtml (Link visited on 2018.10.24).